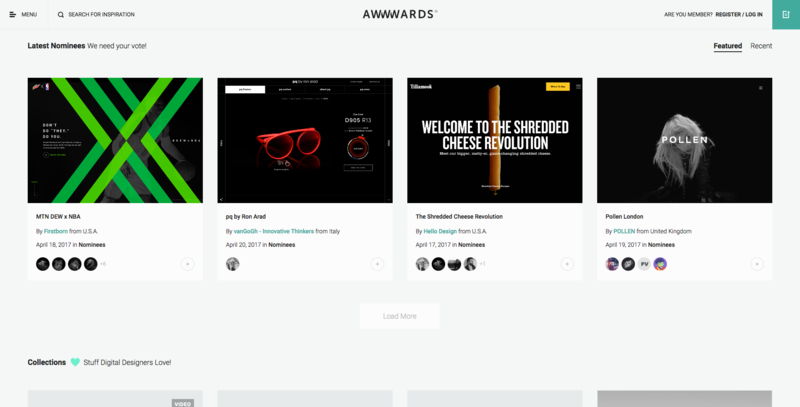 The Bumper Web Design Inspiration List. Prepare to be inspired. I think I can confidently speak for everyone when I say that sometimes we’re just stumped for ideas when it comes to client websites or apps. I’ve put together this bumper list of sites to draw inspiration from when it comes to web design and UX design. There’s nothing worse than being stuck for ideas in the web design game, sometimes just taking a step back and committing some time to mood boarding and gaining inspiration can really pay off. In my opinion it’s a vital part of the web design process and should never be missed. 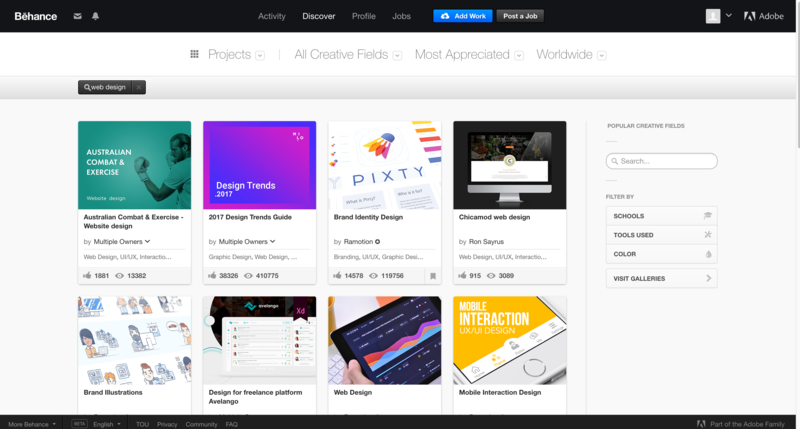 Behance is a pretty good place to start, along with Dribbble which we’ll talk about later. I like the tiled display of posts and you can filter by creative field, country etc. The ability to filter by country is handy as trends are different across the world, so it’s always a good idea to get a feel of what works in different markets. 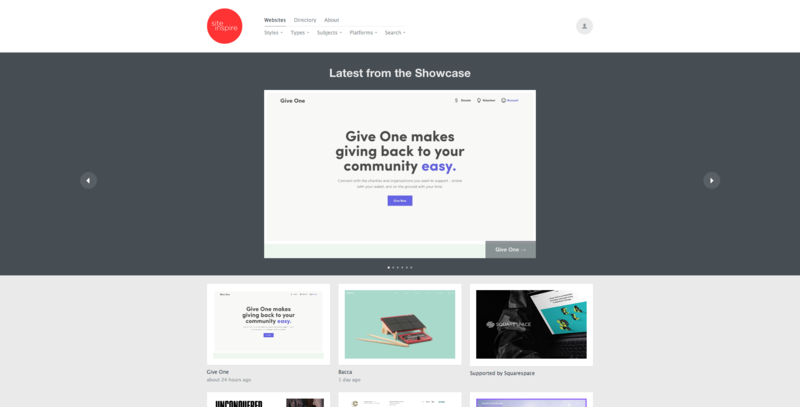 Pretty similar to behance in terms of design, feels like one copied the other (but keep me out of it). Another great resource for seeing the work of other designers and getting to grips with what’s working well in different areas. It’s worth noting that you don’t just have to look at websites for inspiration either, I’ve seen some amazing posters on behance and dribbble before that I’ve drawn inspiration from and then converted to work with the web. I’ve always loved this site and, although their lazyloading is a bit clunky with their re-design, it still fits the purpose very well. One tip though, don’t look at this website midway through a build — it’ll make you want to rip everything up and start again every time. It makes me sound like a caveman, but I love the fact that siteinspire just have a large carousel area to scroll through the latest designs submitted to them. Something about that just puts me at ease! They’ve got some pretty cool functionality too, with the ability to filter by style, types of site, subjects and even the platform they’re built on. Worth a look! Nicely Done is, well, nicely done. A great site if you’ve been given a specific brief such as ‘design me a landing page that gets a decent conversion rate’ as you can filter down by the type of site on display. A lot of startups get featured on here too which makes it a pretty good resource as they tend to be a bit more forward-thinking when it comes to design than the average bricks and mortar businesses. Again, really like the design of this one and how easy to use the UI is. A pretty simple and cool way to look at what other designers are doing when it comes to designing product pages (they also have sister sites for checkout pages, pricing pages and store pages). I really like the simplicity of this one although the lack of filtering means it’s more of a starting point than somewhere to find specific inspiration. Love it, love it, love it! The ability to filter down by colour is a particular highlight of this landing page inspiration website. Sometimes, although I wish I could tell you this wasn’t true, you’ll sit down with a client and be told that their ‘brand’ is the worst colour combination you’ve ever heard of. Fortunately, we have inspirational sites like this so we can see what others have done with equally horrendous colour schemes. I’d love to hear some of your bad colour scheme stories in the comments by the way! Blink captures redesigns of some of the most popular websites in the world — allowing you to see a before and after of the redesign which can give you some really cool insights into how the top companies are approaching conversion rate optimisation. Always a good idea to look at funded companies like spotify et al when you’re looking for new ideas as they’ve usually got a pretty hefty budget to invest in design and can utilise some of the world’s top creative talent. Always good to look at the awards websites, they’re voted for in huge numbers after all. You’ll see some of the newest approaches to design on sites like this and I always recommend keeping an eye on upcoming web design trends so you can start merging them into your work where appropriate. Admittedly, I think the overall quality of posts on creative bloq has deteriorated pretty significantly over the years, but you can still unearth some gems amongst the 13 ways type posts. Always a firm favourite at every agency I’ve ever worked at and at the agency I now run. Smashing Mag do a great job of staying in line with the times and not falling too heavily into the trap of mass content production (ahem, Creative Bloq). As well as inspiration, they’ve got a lot of practical articles to help you do web better. Worth a look if you haven’t seen it already. I hope you found that useful, I’m going to try and keep adding to this resource over time, so I’d love to hear about some of the websites you use for web design inspiration in the comments — I look forward to speaking to you!